In case you didn’t know, the new release of IntelliJ IDEA comes with deployment tools for CloudBees, a rapidly growing cloud platform for Java applications. 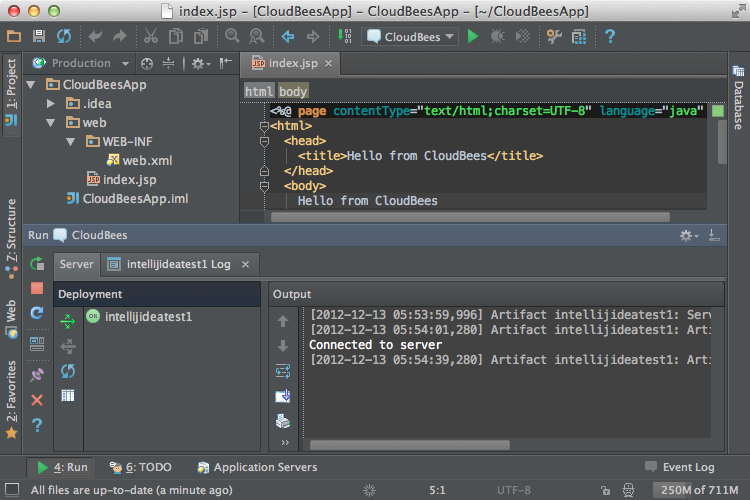 At the moment IntelliJ IDEA allows you to connect to your CloudBees account and view/manage deployed applications. Please follow this quick tutorial to learn how to deploy a simple web application to CloudBees from IntelliJ IDEA. We hope you’ll enjoy your experience in the clouds with IntelliJ IDEA 12. Feel free to share your feedback with us on the discussion forum and in our issue tracker. This entry was posted in New Features and tagged Cloud Tools, CloudBees, Clouds, Leda. Bookmark the permalink. I am trying to deploy a grails application to cloudbees …but I am getting the following error. 2013-05-08 10:09:04,790] Artifact gcloud: Server is not connected. Deploy is not available. [2013-05-08 10:09:09,091] Artifact gcloud: Error during artifact deployment. See server log for details. I followed the tutorial mentioned here …http://confluence.jetbrains.com/display/IntelliJIDEA/CloudBees to setup the cloudbees-intellij integration. in settings : where to get ? and similar patterns did not find any.. I have followed the tutorial at the link above ( http://confluence.jetbrains.com/display/IntelliJIDEA/CloudBees ) but my ‘Hello World’ app is built in Groovy/GRAILS 2.2.2 framework. I am unable to duplicate the steps in the tutorial successfully, especially as regards the WAR file, and its location in the project structure. I have ultimately been successful, but only after  downloading the CloudBees SDK and  emulating steps in this tutorial –> ( http://wiki.cloudbees.com/bin/export/RUN/Grails?format=pdf )… however I think this defeats the purpose/utility of having CloudBees support in IntelliJ. @Michael Yes, CloudBees support is available so far only for WAR artifacts (which is not supported out-of-the-box for Grails applications). I hope we will fix this when the new Cloud API is implemented probably in 13v.